Munich - Hamburger SV prolonged their Bundesliga status by another two weeks at least, despite suffering a 3-2 at 1. FSV Mainz, who qualified for the UEFA Europa League courtesy of that victory at the Coface Arena. 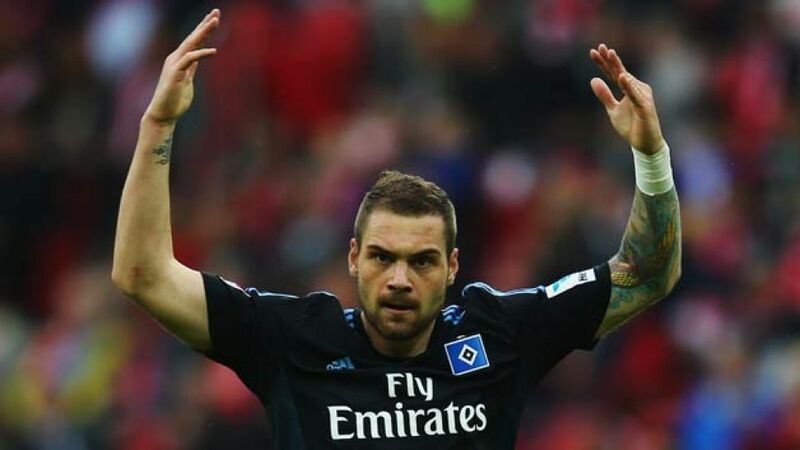 Hamburger SV lived to fight another day as a Bundesliga outfit despite a 3-2 defeat against 1. FSV Mainz 05, who will enter the UEFA Europa League at the qualifying stage. The Red Shorts got off to the worst possible start against the Carnival club when Colombian midfielder Elkin Soto capitalised on an error by HSV defender Heiko Westermann to finish past Rene Adler, but Pierre-Michel Lasogga headed home the equaliser less than five minutes later after Loris Karius had parried Rafael van der Vaart’s effort into the path of the 21-year-old. The visitors seemed to draw confidence from Lasogga’s strike and twice went close to taking the lead before the interval, but van der Vaart and Michael Mancienne were denied by Soto and Karius respectively. Mirko Slomka’s side had Rene Adler to thank for keeping the visitors on level terms with two saves in quick succession from Zdenek Pospech and Johannes Geis, before Lasogga went close to doubling his personal tally for the afternoon with a sumptuous effort which curled just wide of the target. Adler could do little to prevent Yunus Malli restoring the hosts’ lead after 65 minutes, the 22-year-old firing low into the bottom corner from Ja-Cheol Koo’s pass. Shinji Okazaki extended Mainz’s advantage with his 15th goal of the season eight minutes from time, before Ivo Ilicevic pulled a goal back for HSV in the dying stages. Slomka’s charges were unable to salvage a draw, but defeats for both Eintracht Braunschweig and and 1. FC Nürnberg mean Hamburg will now enter a two-legged play-off with the third-placed team from Bundesliga 2, which will determine their Bundesliga future. 1899 Hoffenheim ended Eintracht Braunschweig’s slim hopes of reaching the relegation play-offs after a 3-1 win at the WIRSOL Rhein-Neckar-Arena. Markus Gisdols men found their rhythm quickly in Sinsheim, bossing proceedings from the off and looking the more threatening side throughout the opening period. Their pressure soon took its toll as Sebastian Rudy nodded the ball into the back of the Eintracht net following a neat move down the left by Andreas Beck. Karim Bellarabi gave Hoffenheim a rare warning half an hour into the game when he sent a long-range effort flying over the crossbar, but Hoffenheim remained in the driving seat and should have doubled their advantage when Kevin Volland found himself through on goal, only for Braunschweig left-back Ken Reichel to clear the ball off the line. Torsten Lieberknecht's side were struggling to cope with the hosts' creativity and found themselves 2-0 down just after the hour mark, Brazilian midfielder Roberto Firmino sending Tobias Strobl’s fine cross past Daniel Davari with a spectacular scissor-kick from the edge of the box for his 16th goal of the season. Braunschweig threw bodies forward trying to find a way back into the game in the final 30 minutes, leaving themselves vulnerable to counter-attacks. Kevin Volland made use of the space afforded to him to slot Fabian Johnson’s pass into the net. Braunschweig substitute Jan Hochscheidt eventually pulled one back for the guests, but it was too little too late for the Lower Saxony side who finished the season bottom of the table, while Hoffenheim end the campaign in a respectable ninth. Augsburg missed out on a place in the UEFA Europa League next season, in spite of a 2-1 win over Eintracht Frankfurt on Matchday 34. Ragnar Klavan and Andre Hahn cancelled out Joselu's early opener at the SGL Arena to seal three points for the hosts, although 1. FSV Mainz 05's win over Hamburger SV ultimately hindered Augsburg from qualifying for Europe. Frankfurt took the lead in the 15th minute when Joselu was left completely unmarked at the far post to head in Sebastian Jung's sweeping cross. The goal seemed just what Augsburg needed to spark them into life, though, and they subsequently took the bull by its horns and levelled 14 minutes later as Klavan saw his first header cleared off the line, but the rebound presented him with another chance for the FCA defender to nod the hosts in front from close range. Augsburg upped the pressure after the restart, carving out several goalscoring opportunities before Hahn eventually found the net in his final game for the club before moving to Borussia Mönchengladbach in the summer, the Germany international heading home Matthias Ostrzolek's cross to seal three points for the Bavarians. Hannover 96 celebrated a topsy-turvy 3-2 win over SC Freiburg in their final game of the 2013/14 season at the HDI-Arena. A Szabolcs Huszti free kick opened the scoring to blow the lid off an otherwise low-key first half in which neither side managed to find an ounce of rhythm in midfield. Freiburg were back in it within five minutes of the restart, though, with Jonathan Schmid rifling home unmarked from Vladimir Darida's pin-point cross. Hannover head coach Tayfun Korkut threw on Artjoms Rudnevs as the Reds attempted to reassert their authority on the contest and the move paid dividends six minutes later when the predatory substitute sent the ball through the legs of Immanuel Höhn before stroking into the corner. The game now there for the taking, Freiburg hauled themselves back on level terms with 12 minutes to play. Darida was again the provider as Philipp Zulechner beat Lars Stindl to the punch to set up a grandstand finale. It was the hosts, however, who had the last laugh, with another substitute - this time Edgar Prib - getting the better of debutant goalkeeper Alexander Schwolow one-on-one. The win sees Hannover finish the season in tenth on 42 points, with Freiburg non-movers in 14th, nine points clear of the relegation zone.